If you're heading south down Mexico way, past Mexico City but before the Guatemala border, you can find the Yucatán Peninsula. That's the place that some folks of the long age persuasion say that a meteorite or asteroid hit some 65 million Darwin years ago and led to the extinction of the dinosaurs. While some call it a "smoking gun" piece of evidence for the dino demise idea and an old earth, others (not just creationists) are not so certain. While the site looks like it would have accommodated a large object from space, but the "smoking gun" didn't eject expected amounts of iridium, which is common in meteorites. Other minerals found there that could be from a meteorite are sparse, and the expected melting is nowhere near deep enough. Creationary scientists speculate that an impact may have happened at the time of the Genesis Flood (the results of the Flood would have eventually led to the demise of dinosaurs), the impact was nowhere near as large as the secular science industry is proclaiming. In secular literature and movies, the most popular explanation for the dinosaurs’ extinction is an asteroid impact. 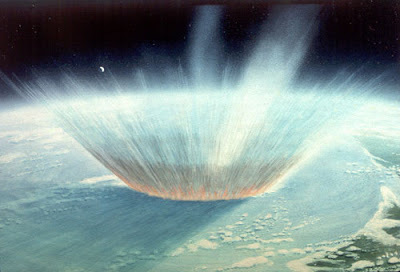 The Chicxulub crater in Mexico is often referred to as the “smoking gun” for this idea. But do the data support an asteroid impact at Chicxulub? I recently reviewed the evidence and found some surprising results. To read the rest of this short but interesting article, click on "Chicxulub Crater Theory Mostly Smoke". Canals on Mars Prove Evolution!